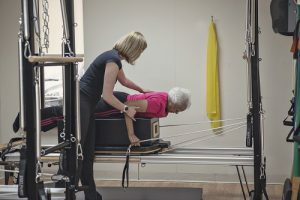 For decades, Pilates has been woven in with physical therapy to rehabilitate patients following injuries to the spine or other parts of the body. But if practiced in a class at least two to three times per week, Pilates also helps prevent injuries. It helps to understand what Pilates is and how it works. In its purest form, Pilates is a challenging and effective exercise that offers total body conditioning. But unlike high impact and/or weight bearing exercise, you’re able to tone and lengthen your muscles through Pilates in such a way that protects you from injury. Have you noticed that you tend to balance better on one foot than the other? Or that you automatically turn to the same side almost every time? It’s totally normal. Most of us have a dominant leg or dominant side of the trunk – just as we have a dominant hand. Wherever there is dominance, there is increased strength. Sounds good, right? The problem is, the opposite side is usually weaker, which creates muscle imbalances. And muscle imbalances are a huge source of injury. Whether you’re a right-handed tennis player or a left-handed office worker, performing multiple movements on the same side every day can result in injuries to the wrist, neck, elbow, shoulders, spine or even hips. The exercises in Pilates are used to first discover any imbalances you may have, then correct them BEFORE they become injuries. Everything movement you make originates at your center. From twisting your torso, to lifting your legs and even swinging your arms, it all flows through your core muscles. The foundation of Pilates is built upon this concept. It recognizes that your functional strength is topped off by the strength of these core muscles, aptly referred to as your “powerhouse” in Pilates. If these powerhouse muscles are not properly engaged during exercise or movement, it can lead to strains, stress fractures and muscle pulls or tears. Possibly worse. Through proper form and a unique exercise methodology, Pilates works to build your core strength while teaching you that proper engagement. Unlike other exercise regimens, Pilates doesn’t emphasize countless repetitions or striving to hit “the next level.” Instead, the focus is on coordinating movements and achieving alignment of the body. Therefore, it looks a bit different from what you might see at the gym. But there’s no arguing that it’s challenging. Pushing yourself in Pilates requires mental focus over physical momentum. Your body AND your mind must work together to perform exercises with precision, while keeping a focus on technique. Movements are performed in a controlled and balanced way. And these two components are absolutely essential in avoiding injury. Because the reality is, nobody is has super powers. Each of us has limitations. And this isn’t a bad thing. Some of these can be overcome. But others are simply biological. And once you understand your body’s natural limitations and discover ways to control them, you’ll have a long-term and effective tool for preventing injury. Are You Ready to Try Pilates? 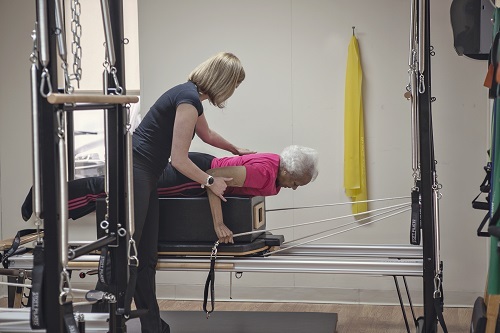 As you can see, Pilates helps prevent injuries by keeping the muscles in balance, strengthening your core and – perhaps most importantly – enhancing your body awareness, coordination and mental concentration. Once you achieve this, you’ll be amazed at how your body just naturally moves more gracefully and with more strength, more awareness and greater control. And moving in this way means you’re far less likely to sustain an injury. If you’re ready to experience for yourself the many benefits of a regular Pilates practice with experienced instructors, please feel free to contact us. We look forward to sharing the practice with you.